Symbolic link is something very common in Unix or Linux environment which allow to link the files and directory and ultimately able to make fool of the application. However, not many of us aware there is a new command in windows (i.e. Mklink) which was introduced in MS Vista. For file (not directory) symbolic linking, remove the /D and for file (not directory) hard link, enter the command with /H. To show all the command help just type "Mklink /?" What is Soft/Symbolic and Hard Link? Soft or symbolic link is just a shortcut to a file or folder.Operating system treats this a shortcut, not the actual location. Sometimes when we want to quick workaround without changing the directory, using symbolic link is one of the ways to make fool of the application. Hard link is directly points to the file. The operating system treats this hard link as the actual location. You may want to do this to fake an application directory if symbolic link doesn't work. How to delete the link? Just as usual, either you can delete it from windows explorer GUI or command line using "rmdir" or "del"command. 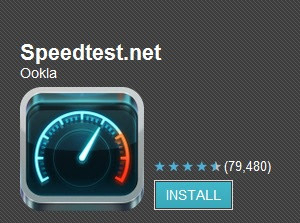 Used to go the www.speedtest.net directly to check for the upload and download speed and now is a lot more convenient to check it out from your phone. I just love this application - Speedtest.net from Google Play!